Domhnall Gleeson is an Irish actor, director and writer. He was born in Dublin and is the eldest son of actor Brendan Gleeson and Mary Gleeson. His father’s acting career, which took off with Braveheart when Domhnall was in high school, influenced his own aspirations. After earning a B.A. in Media Arts from the Dublin Institution of Technology, he made the choice to follow in his father’s footsteps. He found early success after starring alongside his dad in the 2004 Oscar-winning short film Six Shooter and has steadily worked his way up in the movie world since. Domhnall has also worked on stage—at 23, he received a Tony award nomination for his role as Davey in The Lieutenant of Inishmore on Broadway. Following that success, he returned to Ireland and worked on writing and directing some short films of his own between acting projects. While receiving critical acclaim for his theater work, Domhnall was also entering the world of feature films. His feature debut was in Boy Eats Girl (2005) and in 2006, he acted alongside his father again in the Irish film Studs. Despite his success on the stage and in Irish and British independent films, Domhnall is best known as ginger-haired Bill Weasley, an older brother of Ron Weasley in the final two Harry Potter movies. His career quickly took off after he was cast in Harry Potter and the Deathly Hallows: Part 1 . In 2010, he appeared in three other movies in addition to the Harry Potter film: Never Let Me Go with Carey Mulligan, Andrew Garfield and Keira Knightley; True Grit with Jeff Bridges, Matt Damon and Hailee Steinfeld; and the Irish movie Sensation. 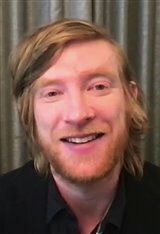 Domhnall’s most substantial, high-profile role to date was that of Konstantin Levin in Joe Wright’s Anna Karenina , in which he again starred opposite Knightley. He and co-star Swedish actress Alicia Vikander earned praise for their portrayal of a timid couple in love. He was nominated for the Best Male Newcomer Empire Award for his turn as Levin and won the award for Breakthrough Performer at Hampton’s International Film Festival, as well as Best Supporting Actor at the Irish Film and Television Awards. Having played supporting roles in most of his previous films, Domhnall found the chance to show off his potential as a leading man in Richard Curtis’ romantic comedy About Time with Rachel McAdams as his love interest. He also plays the lead in the comedy Frank with Michael Fassbender and Maggie Gyllenhaal. Despite his Hollywood breakout, Domhnall hasn’t forgotten his roots—in 2013, he appeared on screen again with his father Brendan in the Irish comedy Calvary and then starred in the British indie film Ex Machina with Oscar Isaac. More recently, he starred in Brooklyn (2015) alongside Soairse Ronan, Star Wars: The Force Awakens (2015), The Revenant (2016), mother! (2017), American Made (2017), Star Wars: The Last Jedi (2017), Goodbye Christopher Robin (2017) and again took on a romantic leading role in the comedy Peter Rabbit (2018), although his rival for the girl is a mischievous bunny.